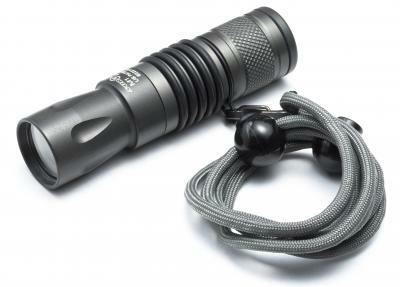 The M1 Illuminator is a handheld infrared illumination device that produces a smooth beam of infrared light for use with night vision devices and infrared-capable video cameras. The M1 produces 10mw of output for 15-hours of runtime on a single lithium battery, and projects a bright, perfectly smooth spot. Key to the M1 Illuminator's performance is the use of a dedicated infrared LED to achieve maximum efficiency (some manufacturers use the less effective, and less expensive, method of placing an infrared filter over an incandescent light source). The M1 Illuminator is CNC machined from aerospace-grade aluminum and coated in a military specification Type III hard-anodized finish. Battery - One lithium 123A 3.0 Volt with 10-year shelf life. LED assembly/Runtime - Proprietary infrared light emitting diode with 10mw output for 15.0 hours on a single battery. Construction - CNC machined aerospace-grade aluminum. MilSpec Type III super-hard anodizing for corrosion and wear-resistance. Flawless infrared beam, always in focus. Patented lock-out tailcap allows the light to be locked in the off position to prevent unintentional activation during storage or transportation.